Now if this were not enough in itself to turn you against this idea let’s throw into the mix that the landfill is just a quarter of a mile from a new $10 million elementary school. The playground has a direct view across an open field of the mountain of the present dump. The wind blows out of the south and carries all of the odors and the 10 toxic gases that are not burned off by the flare right across I-88, across the meadow to the school. One of the gases is hydrogen sulfide. There are no studies of what effect this gas in small doses over a period of years will have on small developing bodies and minds. The present landfill has already had one excessive hydrogen sulfide leak for several weeks that they did not feel they needed to inform the public of. Also, the current landfill is leaking. The Illinois Environmental Protection Agency (IEPA) has been monitoring the leakage and has instructed Waste Management on mediation for the problem. This has been a common tactic of WMI over the years. 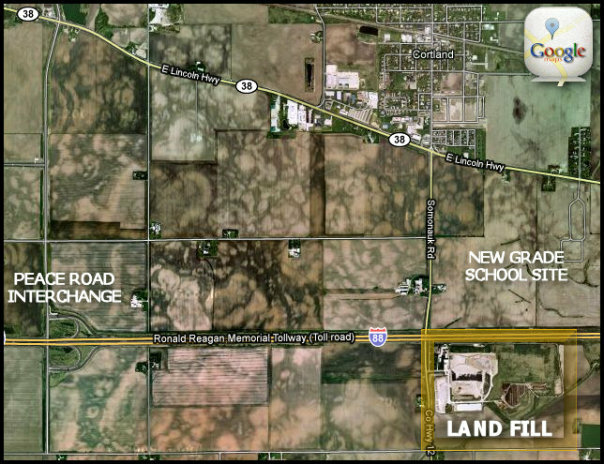 The company will buy an existing landfill and then use the leakage problem as a bargaining chip with the county officials to expand the landfill. They are telling local DeKalb civic organizations, the county board, etc. that they cannot afford to fix the leaking problem properly unless they are allowed to expand. This tactic has been working here in DeKalb thus far, but now that the word is spreading of what is about to happen to the county people are beginning to wake up to the blackmail this ploy really is. Think about it, a multi-billion dollar international corporation, the largest waste hauling company in the world, has to shake down a small rural county in order to run an 88 acre landfill properly? Another example of how our legal systems and governmental policies favor the corporations is to examine the siting process. The rules of the process state that once the application has been turned in by the applicant, in this case WMI, there is to be no “ex parte” communication between the applicant and the county board members. However the county board members have also been placed under a gag order by the county administration from speaking with their constituents about the expansion until after the vote. Now this rule does not apply before the application is turned in. So WMI was able to give the county board members a private tour of their facility in Will County. They were also allowed to talk with board members while they were negotiating the host agreement. During these negotiations the board members who were the most environmentally conscious negotiated $100,000 per year for the Forrest Preserve District and $200,000 per year for their “Go Green Initiative,” all money to come from the tipping fees. 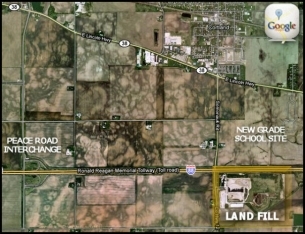 Also, the small town of Cortland, located three-quarters of a mile to the north of the landfill also negotiated a million dollars for the town as long as the town of Cortland did not lodge any objection to the expansion. This legal bribery is another common tactic, which after the deal is okayed a municipality often has to take WMI to court to force them to keep their promises. Just ask someone who lives in South Elgin and is familiar with the case of South Elgin v. Waste Management for breach of contract. Waste Management is a $13 billion multi-national corporation with a dark history of not operating landfills properly. Waste Management has had to pay hundreds of millions of dollars in fines, penalties, and court settlements. As one example out of hundreds, consider the court case where Waste Management had to pay over $5 million dollars to settle a fraud case that involved WMI falsifying water quality reports. They also have been found guilty of bribing public officials. Such a wholesome company to do business with. The majority of DeKalb County citizens are just now learning about the proposed expansion and the County Board will make their final vote on the expansion application by WMI on May 10th. When the voters call their elected representatives, County Board members have said that they are “trying to sway a judge.” Some are afraid they may face legal consequences because they dared to tell their representative that they want them to vote no on this expansion application. What an affront to democracy. The county hired Renee Cipriano to represent the interests of the county. However it has been unclear if she represents the county or is hired by the administration to smooth over any concerns county board members may have to insure the application is approved. You may recall Renee Cipriano was the former Director of the IEPA. She worked to create stronger regulation of mercury released in the air by coal-powered electrical plants. Within six months of leaving the IPEA and returning to private practice, she was representing Ameren Power Company and fighting against stronger regulation of mercury release. Ameren owns seven coal-fired power plants is one of the leading contributors to the amount of mercury in the air and water of Illinois. She also violated the ethics rules which state an Illinois employee cannot work for a company they were once regulating for one year after leaving office. What a sordid affair it is out here where the corn grows tall. Now that the public awareness is growing the County Board has moved their vote up from the regular meeting on the 19th to May 10th. So the voters only have a few days to try and be heard by their elected officials. That is if they dare being verbally reprimanded for acting as if they lived in a democracy. This entry was posted on Sunday, May 2nd, 2010 at 9:49 pm	and is filed under The Front Page. You can follow any responses to this entry through the RSS 2.0 feed. You can skip to the end and leave a response. Pinging is currently not allowed.